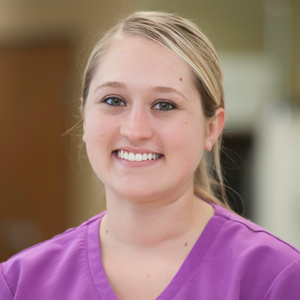 Katelyn received her Bachelors of Science in Veterinary Technology from Michigan State University. She joined AEC as a technician in 2015 after completing an internship at the Detroit Zoo. Katelyn also previously worked at Green Meadows Dairy Farm and the emergency rotation at MSU. Katelyn enjoys being able to help take care of very ill patient's in the hospital and being able to see them get better and go home. "The owners are always so appreciative, and it makes me feel good that I was able to help care for their pet". Katelyn enjoys learning from the experienced staff at AEC and welcomes the opportunity to grow her technician skills. She has a special interest in small mammals such as rabbits, guinea pigs and ferrets. When Katelyn isn't busy working at AEC she hangs out with her three cats: Luna - her son, Odin and daughter, Peach.